Christmas. What does Christmas mean to me, what do I think about it? Well, four things to mention. First, as I see Christmas in the UK, its really a time for children. I can well remember its magic 60 and more years ago and, regardless of how many of the myths children here do or don’t believe now, its still a magical time for them (and an increasingly expensive one for their parents). I approach every Christmas hoping that the few children that I know, at least, will be happy. Second, “The Christmas Story” and the other religious sides to Christmas are simply not me. As Bob Dylan so succinctly put it in The Mighty Quinn: “It ain’t my cup of meat”. And a common saying here is that Christmas is the Season of Goodwill whereas, being a bit picky perhaps, I’d prefer goodwill to be around during all the other seasons too 😉 . And finally, I’m amazed by the vast and almost hysterical, materialistic and commercialised juggernaut that Christmas has become in the UK. 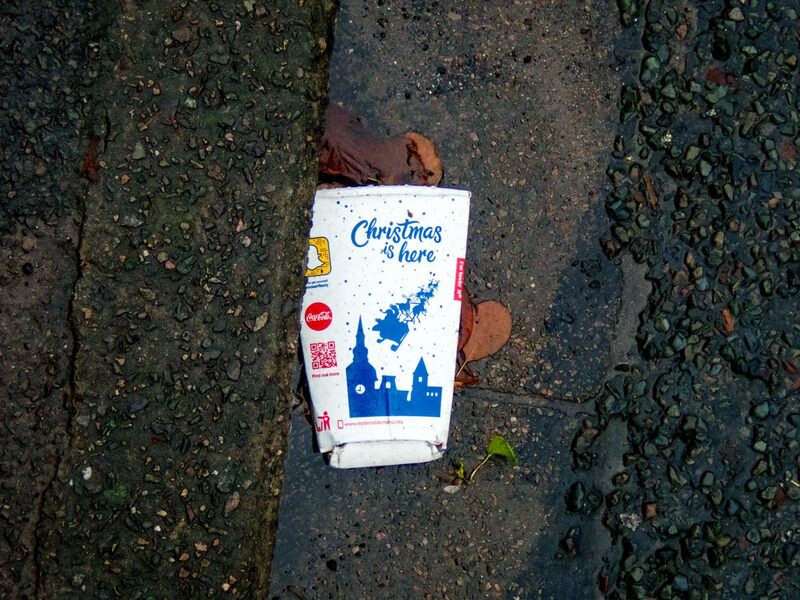 The two pictures here are not intended to allude to any connections between Christmas and the gutter, but to me they are symbolic of this vast commercialisation which, in Bristol at least, started making itself apparent around the beginning of September. And, irreligious as I am, I do feel sorrow for those for whom Christmas has a religious significance: it must be very grim and disheartening to see it so swamped by the various non-spiritual behemoths. 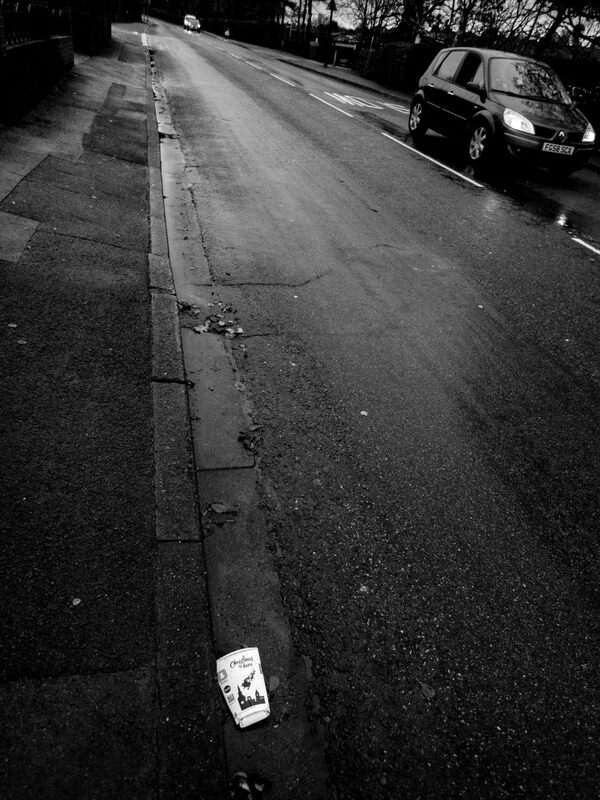 The first image in the Outer Suburbs series, with context, is here: 1 . Subsequent images are here: 2 3 4 5 6 7 8 9 10 11 12 13 14 15 16 17 18 19 20 21 22 23 24 25 26 27 28 29 30 31 32 33 34 35 36 37 38 39 40 41 42 . Each will open in a separate window. Click twice onto the images to enlarge them in separate windows. Technique: TG-5; Lightroom; south Bristol; 1 Dec 2018. Well put, Adrian, and it is sadly the same or worse here in the US. The marketing enterprise is always pushing on to the next thing that will make money and takes away from our ability to enjoy the here and now. such wonderful angles always Adrian! A rueful laugh when I see these two photos….and a nod of the head to each of your four points. Well done! Thanks for your thoughts, Mr C! Yes, I recall being on a bus with two young women sitting behind me, and one told the other that she’s spent so much on having “the perfect Christmas” that it was going to take most of the coming year to repay the debts. And you’re absolutely right about the increased stress / depression Christmas brings for isolated, socially marginalised and homeless people too, that is a very real thing. But Christmas is all about money now, and because of that nothing (incl the domestic violence you mention) must be allowed to spoil the illusion. Over the years, I have spent several Christmases completely alone, and the reaction when I told friends of that intention was intense – “Are you sure you’ll be alright on your own?” etc etc – well I spend other days alone, so what’s the difference >>> its all in the mind! >>> its all how we’ve been conditioned to be in our society. I agree with you and do not ‘do’ Christmas.. I feel it should be Christmas every day or not at all.